Order business cards, design banners for an upcoming tradeshow, or send out a welcome kit for new clients. Each web-to-print storefront is fully customizable to meet your organization’s business requirements including approval workflows, billing set up, reporting, and more. Pay for everything in one convenient place. All of this saves your team valuable time and resources so you can stay focused on achieving your marketing goals, rather than managing orders and logistics. It takes time to create a brand, and it's easy to misrepresent it with the wrong marketing materials. 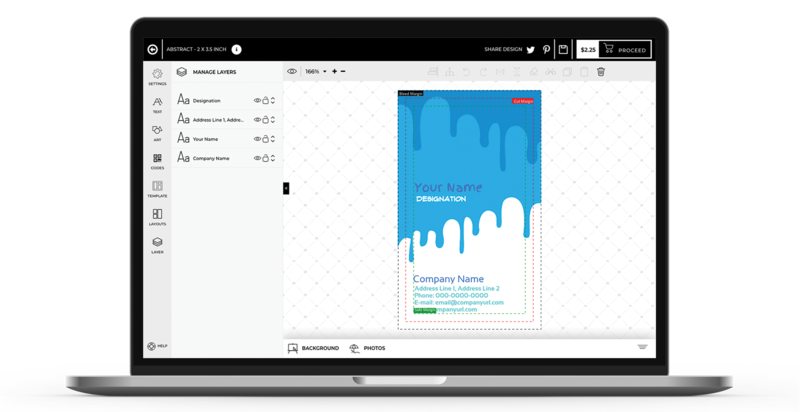 By using an online storefront you can create print-on-demand templates for everything from brochures to banners. Marketing teams can work hard to create an organization’s brand standards so it’s nice to know there’s a way to keep it intact. Materials created from the storefront—using templates set up by the marketing team—will always have the right design, colors, fonts, and paper stock no matter where and how they are used. In addition, you can create one look for your brand but make small changes to meet the needs of different offices or store locations. For instance, you can make the same marketing brochure but change the address, images, or services offered to fit each location without bogging down your graphic design team. With an online storefront, you guarantee that everyone orders the most up-to-date marketing materials which can be critical for some industries. The web-based software allows you to track inventory of specific versions and product revisions. All of the data is captured so you can run reports to see which versions of your products and materials were shipped to each location. This can be particularly helpful for a financial services company whose margins may change every quarter or a health care provider whose patient benefits have specified effective dates, require amendments, or are updated frequently.  You’ll save time by updating materials in one location plus you can easily notify users when a new version or product is available. Instead of sending out multiple communications and files, users will be able to visit one convenient website to obtain the latest and greatest materials for your company. Marketers can plan ahead thanks to in-depth reports that track print volumes and order history. 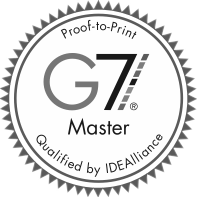 You'll know exactly what you printed and how many, giving you the ability to make budget-conscious decisions for the quarter or year ahead. There are also reports that show you where your materials are being used and any outliers that need to be addressed. For example, let’s say you have a 10-person sales team and 75% of the orders in the past 12 months went to 1 or 2 salespeople. That’s probably cause for further analysis and/or training to make sure everyone is aware of the sales tools available to them. Forget storing a closet full of marketing materials, counting brochures, and tracking promotional items on a spreadsheet. Store everything online instead! 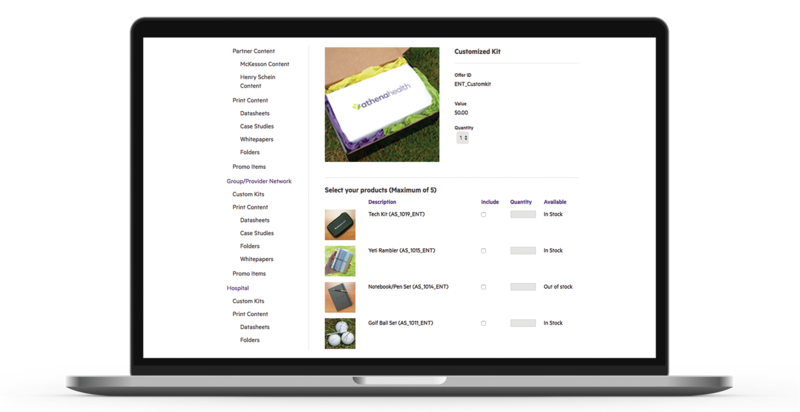 With a web-to-print storefront, you can see your inventory online in real-time, 24/7. And you’ll automatically be reminded to re-order materials with low-inventory notifications based on the thresholds you set. Or you can set your marketing on autopilot with automatic reorder points to streamline the process even further. You can’t waste materials if you only order them when you need them. Rather than stockpiling boxes upon boxes of brochures, postcards, and sell sheets, you can print-on-demand in just a few clicks. Headed to a trade show? Don't drag boxes all over, have your materials shipped right to the convention center or to a business location of your choice. And when the show is over send your booth back to make sure it is stored properly for the next event. Need to ship to multiple locations? With a storefront, you can also place one order and drop ship varying amounts—or even different products—directly to each location. Shipping outside of the country? If you’re ordering print-on-demand items to go overseas, you can leverage our global print network and produce materials in the country it’s shipping to. This saves you a ton of money on shipping and bypasses customs ensuring that your materials get where they need to be as quickly as possible. An online storefront puts convenient shipping at your fingertips but it also alleviates the stress and often complicated shipping process. 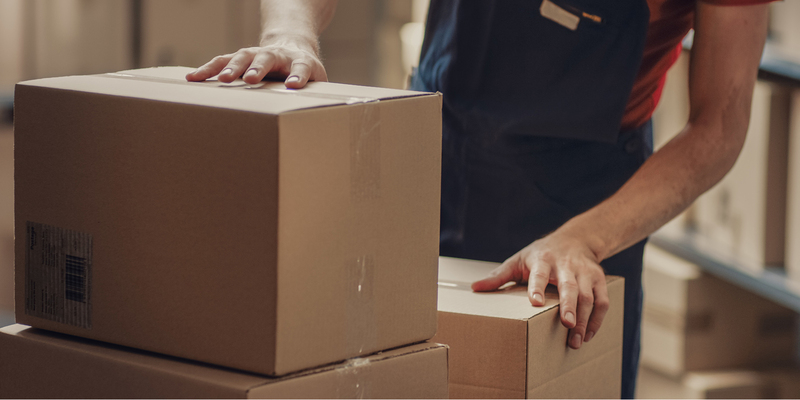 Behind-the-scenes fulfillment specialists, ensure that your delivery arrives safely and in the most economical way possible. Plus, you'll always know exactly where your package is with convenient tracking notifications. Consumers respond to personalized outreach. 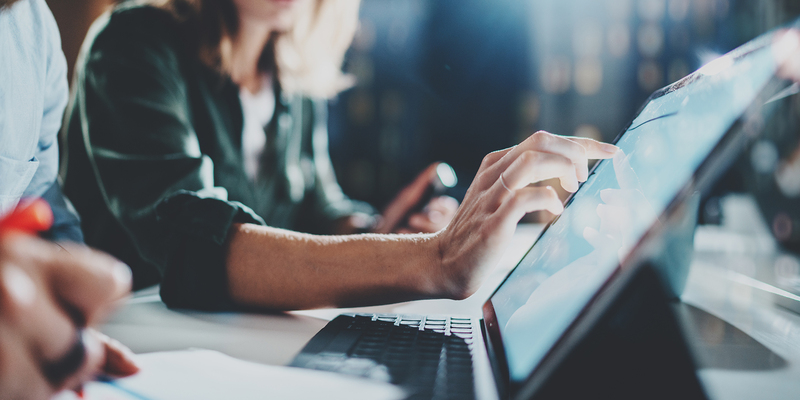 In fact, leads who are nurtured with personalized content generate a 20 percent increase in sales opportunities, according to a report from Demand Gen.
It’s yet another area where a web-to-print storefront can help. Marketing can personalize sales letters or create custom packages and sales kits by industry or customer persona. Then your sales team can personalize each kit and ship it directly to prospective clients. Some storefront solutions, like the one we utilize for Shawmut clients, can also be integrated with Salesforce.com or other CRM platforms—making it quick and easy for your sales team to stay top of mind with prospects. With a storefront and CRM integration, your sales team only needs one login to quickly order and ship materials. Online storefronts give everyone a central location to customize, order, and pay for materials. Any registered user will have the power to create what they need, rather than relying on the marketing team to handle every request. Plus they’ll save time researching vendors, placing orders, tracking shipments, and working with multiple vendors. Storefronts also offer big-time savings when it comes to billing. Imagine getting one monthly bill that shows all of the print marketing orders across your company. You’ll be able to conveniently pay one invoice rather than dealing with multiple vendors and billing systems—the accounting team will thank you! Although a web-to-print storefront can have many registered users, there are lots of checks and balances that can be built into the system to ensure that resources are spent wisely. Managers can set up approval points, limit access to products, or set spending limits. When an approval process is in place, orders remain in a pending status until they are approved by an administrator. The approvals can be processed for entire orders or individual products within each order. Once approved the system will complete the remainder of the order process. Alternatively, if you prefer a more hands-off approach, you can set order limits on specific items, or give users a monthly allowance. The storefront can also accommodate specific billing requirements. For example, cost centers can be used to tie expenses back to individual departments or you can allocate everything to one area of your business. Corporate marketing teams can also keep their promotional budget in check by placing one order for company swag, like t-shirts or stress balls. This allows you to leverage volume discounts and store the excess in inventory for later use. If your company has multiple locations, staff members can order promotional products from a shared inventory rather than separate orders through multiple vendors. A web-to-print storefront makes it easier to grow your brand. As your business expands with new locations or products, the marketing team can easily add new materials to the storefront. New locations or product teams can access the marketing materials online and place orders for everything from product brochures, to grand opening banners, signage and more. All of the marketing materials needed to launch and market the new location or product are ready to go in one convenient place. 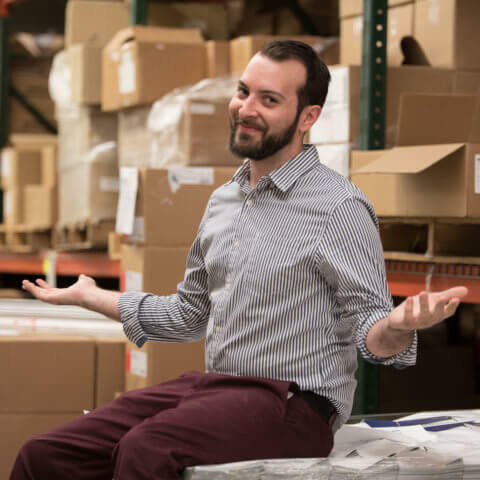 Mike DeSisto serves as Shawmut’s Fulfillment Manager and is responsible for the initial setup and continued support of Shawmut’s online storefront solutions. As the project lead, Mike works with each client to configure their specific storefront which may include custom branding, templates, workflows, approval rules, reporting and more. In addition, Mike oversees our warehouse and fulfillment staff and provides technical support to storefront users.